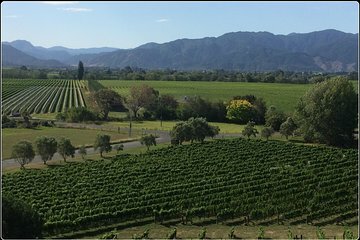 Marlborough is New Zealand’s largest wine region and a renowned foodie hotspot. Customise your itinerary on this private 6-hour tour from Picton and taste an array of regional delicacies, sweet treats, and fine wines. Optional activities include a visit to the Omaka Air Museum, a tour of a local brewery, or a cruise around the Marlborough Sounds. Your day begins with a morning pick-up from your Picton hotel by private vehicle. Having discussed your itinerary in advance, your local guide will have everything arranged for your custom-made tour, so all you have to do is sit back and soak up the scenery as you drive through the vineyards of the Wairau Valley, or past the snow-capped peaks and glittering waters of the Marlborough Sounds. Follow the Marlborough Wine Trail, pausing to enjoy wine tasting at some of Marlborough’s celebrated wineries, and sample popular regional varietals such as Sauvignon Blanc, Riesling, and Pinot Noir. Along the way, visit artisan boutiques, orchards, and street stalls, to sample an array of gourmet oils, chutneys, liqueurs, and cheeses; indulge in sweet treats like homemade gelato, chocolate and fudge; and tuck into fresh seasonal fruits like cherries, apricots, and nectarines. As you browse the shops, they’ll be plenty of opportunities to purchase regional specialties such as black garlic, smoked mushrooms, and Manuka honey. For lunch (own expense), choose from one of the many cafés or restaurants overlooking the Marlborough Sounds, where you might want to try local dishes like salmon or green lip mussels, or indulge in a delicious Devonshire tea. The rest of your tour is yours to customize to your preferences, and possible activities include a thrilling jet boat ride around the Marlborough Sounds (extra cost); a tour of the Omaka Air Museum; or a visit to a local artist’s workshop.